Do you have a tot who is hooked on Dinosaur Train? Maybe they love going to the museum to check out all of the cool dinosaur fossils. It is pretty cool that these things used to inhabit the Earth, isn’t it? We are kind of jealous of our kids around here knowing that it’s cool for them to like dinosaurs. We wish we could still, as the very cool people we are, rock a dinosaur costume on Halloween! 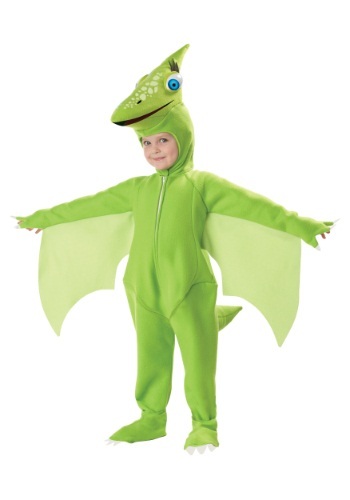 With this costume, they'll be living it up as Tiny Pteranodon, just like on the show. Just like the animated show, your little one can play out all of the Pteranodon's adventures, but keep your eyes peeled for the Dinosaur Train! When it comes, neither of you are going to want to miss it.! This kids dinosaur costume comes with all of the essential pieces necessary to help your child transform into a dinosaur this Halloween (or maybe even just for play time!). The costume starts with the green jumpsuit that zips in the front for easy on and off all night long. The matching shoe covers have elastic bands at the bottom to secure them over your child’s shoes. The character hood has large plastic eyes on top to help your child look like something straight out of the Paleolithic Era! Round up a bunch of your child’s friends to go as dinosaurs too and they’ll be ready for a night out on the town in search of candy! And who knows, they may even spot the Dinosaur Train while they are out!